A BuyNOW Bonus™ could be a gift certificate (or gift certificates) for items like: Home furnishings, moving & storage, carpet and flooring, etc. © Copyright All Rights Reserved. 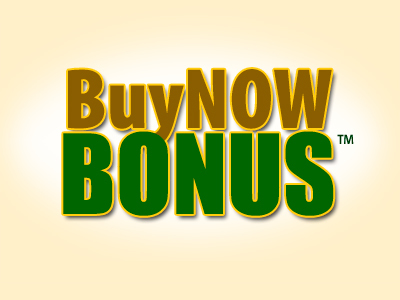 BuyNow Bonus™ is available through subscribing members of Compass Realty Systems. (314) 414-2020. How Much? Ask your agent or Click Here and select the address of the property you saw advertised. Motivated Homesellers offer a BuyNOW Bonus™ to get buyers to make offers... NOW!